After months of planning; script writing, casting, shot listing, storyboarding, location scouting and costume design and creation to name but a few, we were on set of our first scene for our new short film ‘Wonderful’. And what a scene it was. We were filming what was possibly the hardest scene in the film to shoot! Typical! Our scene takes place in our villains evil lair. 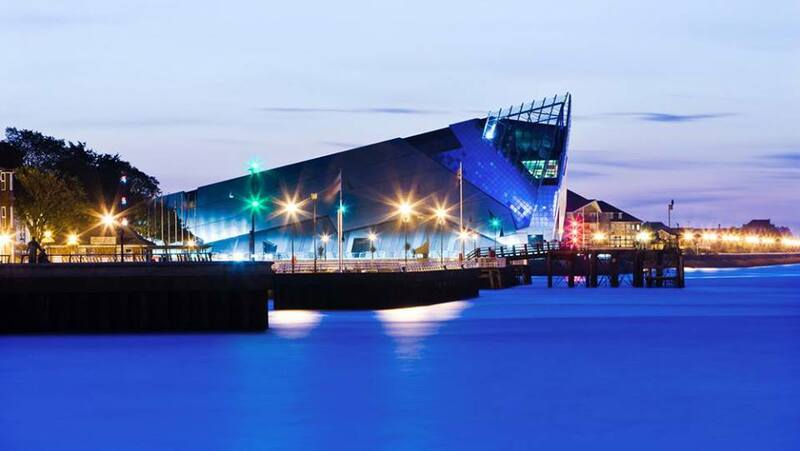 For this location, we approached The Deep in Hull, which is one of the UK’s largest aquariums, home to sharks, penguins, jellyfish and more! They were absolutely brilliant and more than happy to help us out. We had access to three different areas in The Deep after closing hours, and the staff were so helpful, we cannot thank them enough! With our brilliant costume maker, Elli, on set, along with our great make-up artist, Andy, and our amazing crew (including Carl, Ben and Neil), we were all set to go. Our first scene took place in front of the giant shark tanks. So not only did our actors (David Aston and Richie Donaldson) have to perform for us, we needed the sharks to do well too! As they seemed to swim in constant circles around the tank we had to time the action to start just as our finned friends passed the front of the tank. With a three camera set up, we made sure we captured the action piece from every angle. Everything went smoothly… success! We then filmed in the Cool Seas area, which is a dark room that has some great neon lighting and an amazing jelly fish tank! A true villains lair! Onwards to the final area to film – a really impressive tunnel of colour changing lights! A great moment for our hero, David, to stride through the tunnel, as we slid backwards on our dolly. We were able to finish everything in this area, much to our relief. By now it was about 9pm and everyone was starting to droop! It was time to call it a night. We got some brilliant footage and was a great start to our film. Yes, we would have to return (if The Deep would have us!) but it was better to get it all right, rather than rush. Time for us, and the sharks, to get some rest! Posted on July 14, 2015, in Our Film News and tagged acting, berry productions, film, filmmakers, filmmaking, hull, indepedent film, indie film, production, Short film, the deep, uk. Bookmark the permalink. Leave a comment.